Here is the text of my address to the 2017 graduating class of the Global Business Journalism Program at Tsinghua University on June 28, 2017. I am honored, on behalf of the International Center for Journalists and the international faculty of the Global Business Journalism Program, to congratulate all of you on your successful completion of your graduate studies. You are a special group – the best young business journalism minds in China, along with a unique mixture of nations: Iran, Israel, Italy, Vietnam, Thailand, Uganda, Zimbabwe, Slovakia, Turkey, Russia, Canada, and the United States. Some of you already have made a mark on the world of business journalism during your Tsinghua years. I have great confidence that many more of you will have an impact in the years to come, in journalism systems as disparate as Iran, the United States and China. We live in an unsettling era when the concept of “truth” can be a matter of dispute. Kellyanne Conway, a counselor to Donald Trump, has declared that the White House is entitled to its own “alternative facts.” Whatever that means. We must respect knowledge, respect truth, and respect ourselves. We owe it to the global public to use the knowledge we have gained about China and about global economics to provide our audiences with intelligent, insightful and factual reports. With your newfound expertise on the Chinese economy, globalization, corporate strategies and much more, you can communicate clearly and comprehensively, on any multimedia platform, about issues ranging from the Paris climate change accords to the Belt and Road Initiative. Truth and justice. The Global Business Journalism program has been trying to live up to the highest international standards for the past 10 years. Since 2007, the GBJ program has combined rigorous academics with practical journalism training in a cross-cultural setting at one of the world’s great universities. Thanks to the vision of brilliant minds such as Professor Li Xiguang, ICFJ president Joyce Barnathan, and ICFJ vice president Vjollca Shtylla, the GBJ program was created. Thanks to the financial and journalistic support of Bloomberg News, ICFJ, the Knight Foundation and Bank of America, it has grown and prospered. Thanks to the commitment of Tsinghua leaders like Dr. Hang Min, Dean Shi, Dean Chen, Dean Hu, Professor Lee Miller, Professor Dai Jia, and many more, it has a bright future. Thanks to dedicated and high-achieving alumni from some 60 countries, GBJ is improving the quality of journalism – and public understanding of economic issues — in China and around the world. Truth. Justice. Words. Knowledge. Tsinghua. That pretty much sums it up. Congratulations on your achievements in the Global Business Journalism Program. I look forward to your truth-telling in the years to come. Thank you for your interest in the USA Summer Journalism Training Program, organized by Rick Dunham, a veteran of 29 years of Washington journalism experience and co-director of the International Center for Journalists’ Global Business Journalism Program. The two-week program is scheduled to be held in Washington, D.C., from July 24 to August 4, 2017, and is open to university students and recent graduates from China and around the world. The application form is included in this post. Please copy-and-paste the form and send it via email to the USA Summer Journalism Training Program at SummerProgramDC@gmail.com. You can reach teaching assistant Li Chengzhang at licz15@mails.tsinghua.edu.cn. 拟毕业时间 When will you (did you) graduate from your university program? Note: Please send your application form, CV, English language certificate copy and a photo of your student ID card to SummerProgramDC@gmail.com. If you have any questions, please feel free to contact Teaching Assistant Li Chengzhang at licz15@mails.tsinghua.edu.cn. By telephone: +86 13426000951, +1 (312) 468-3257. Note: Global Business Journalism students and Tsinghua School of Journalism and Communication students are eligible for a scholarship to cover $500 of the costs, making their final fee $1,000. Note: GBJ and TSJC students who also enroll in the City University of New York Summer Intensive program are eligible for a scholarship to cover $750 of their costs, making their final fee $750. Ken Herman (center) talks to Global Business Journalism Program students, flanked by Rick Dunham (left) and Sharon Jayson (right). 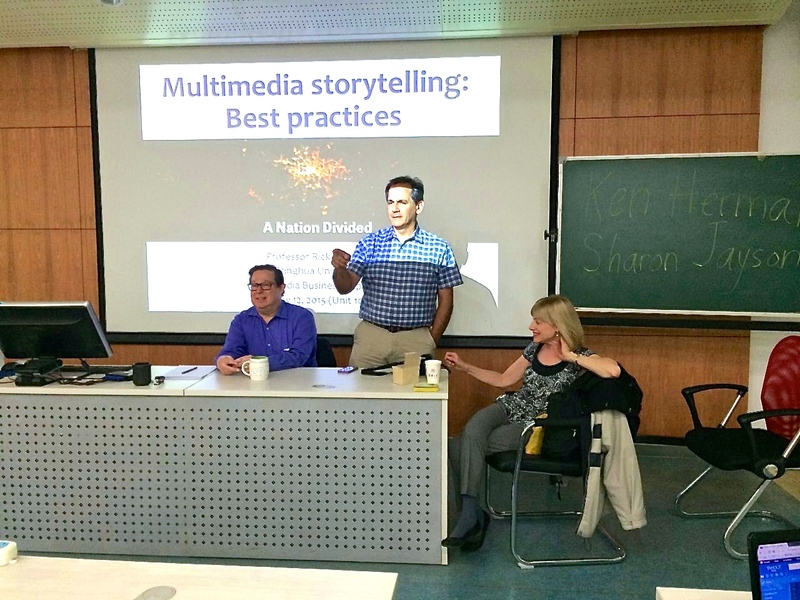 Pulitzer Prize-winning journalist Ken Herman encouraged students in Tsinghua University’s Global Business Journalism Program to experiment with the many new technological tools available to today’s reporters. 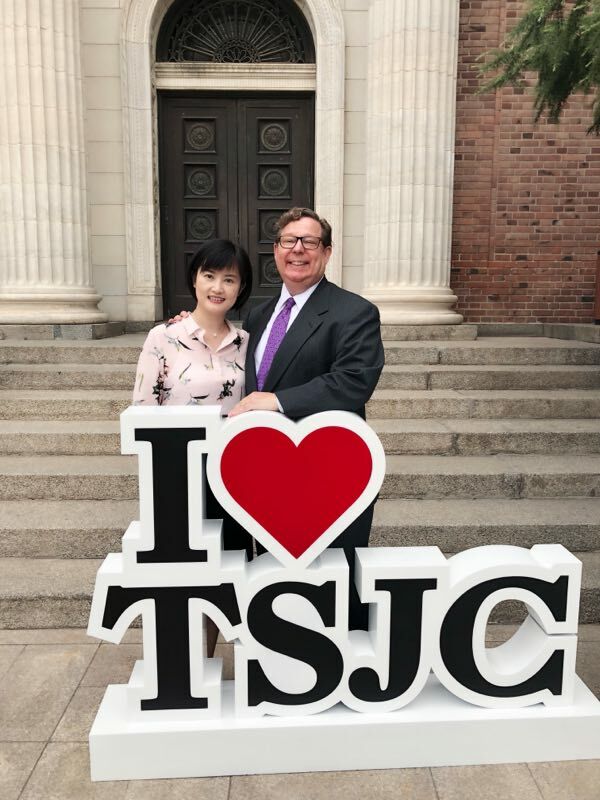 Herman and his wife Sharon Jayson, a longtime reporter for USA Today, spoke to Professor Rick Dunham’s Data Journalism and Multimedia Business Reporting classes at the Tsinghua School of Journalism and Communication. They told the stories of their award-winning journalism careers and advised students to master traditional news writing, audio, video and social media. Jayson’s three-decade career has included stints as a television news reporter and anchor, a radio station reporter, a radio network Austin bureau chief and a newspaper journalist in Washington and Austin. 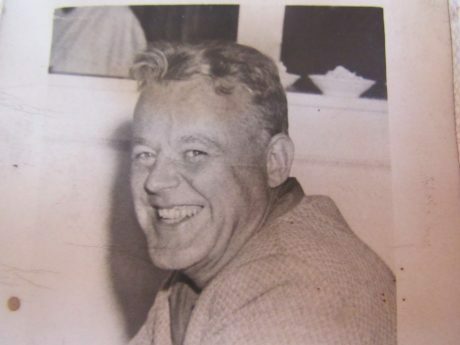 Herman, who covered George W. Bush both during his days as governor of Texas and president of the United States, won the Pulitzer Prize for Public Service in 1977 for a series of stories in the Lufkin (Texas) News investigating the death of a young recruit in the U.S. military. The series led to congressional hearings and changes in American military recruiting practices. For the past six years, he has written a newspaper column that sometimes covers serious policy topics and often uses humor to make his points. “I feel it is important to tell people what is going on in their government – or just entertain them,” he said. Jayson, who specialized in coverage of younger Americans and human relationships during her decade at USA Today, said she knew she wanted to be a reporter from the age of 12, when she worked on a newspaper at her school. She encouraged the students to follow their passion in life, like she did, even if it does not lead to material wealth. “Don’t just accept something because you think you’re going to get rich,” she said. 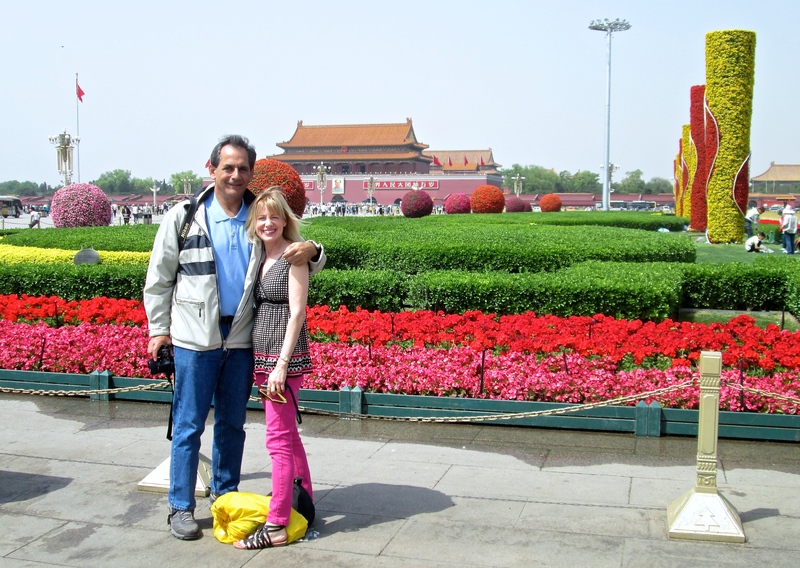 Ken and Sharon in Tian’anmen Square, with the Forbidden City in the background.